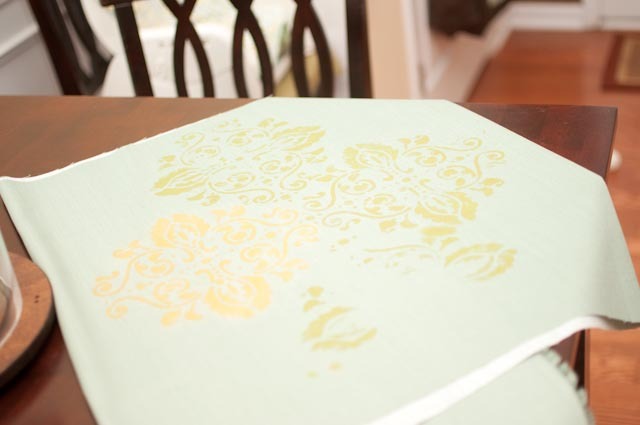 There has been a lot of fabric painting going on in the blog world lately and seeing painted chairs and rugs inspired me to paint my no-sew curtains using a stencil and some fabric medium. I decided that my living room needed a little something more after I got most of the new stuff in place for my living room re-vamp. What was missing was a large scale pattern and a little more green. I was inspired by the curtains in Kirsten's living room over at 6th Street Design School. 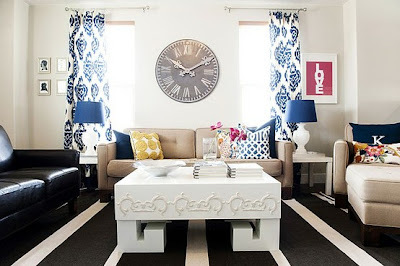 I wanted the look of large printed medallions on my curtains, but I could not find a large stencil that was cheap. Craft stores only had small scale stencils and the big ones that I saw online were about $40 and up. I'd already spent more than I planned on my curtains so I was not about to sink $40+ more into them. I bought the biggest stencil I could find at Michael's (it was $10) that looked the most like the pattern I wanted, and even though it was the biggest stencil they had, the medallion was only 8 inches. I had to put four of the shapes together to get the size that I wanted. 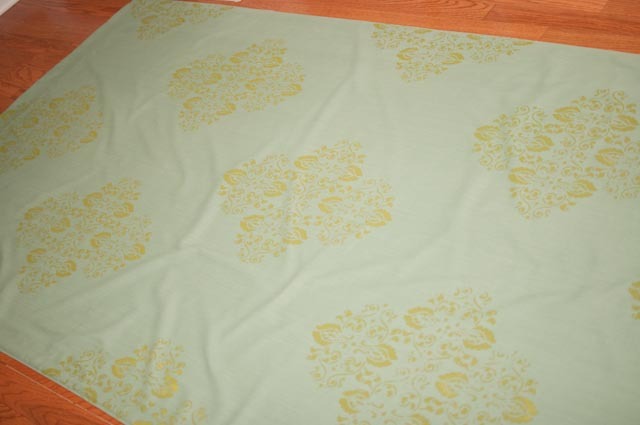 That's the fabric that I tested my paint and pattern on. 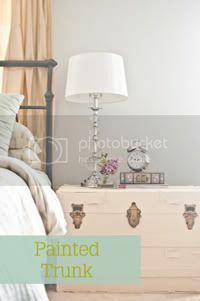 The paint I used was just plain acrylic craft paint. I had to get a few bottles to mix in order to get the color I wanted. I added fabric medium which makes the paint not crunchy and less likely to bleed. 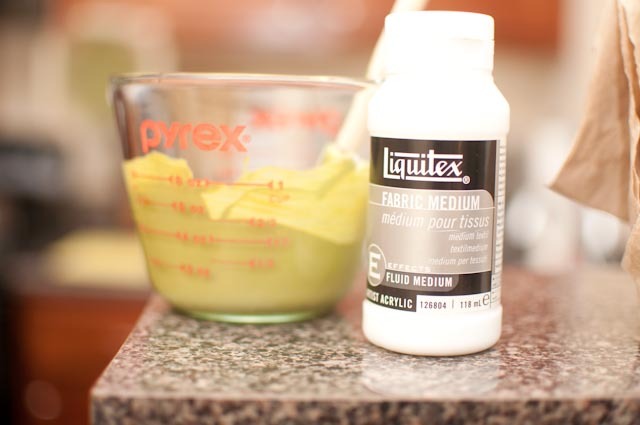 The bottle of fabric medium was $4.50. I think I've read that it's available at Michael's, but I didn't see it there so I had to go to an art supply store to find it. 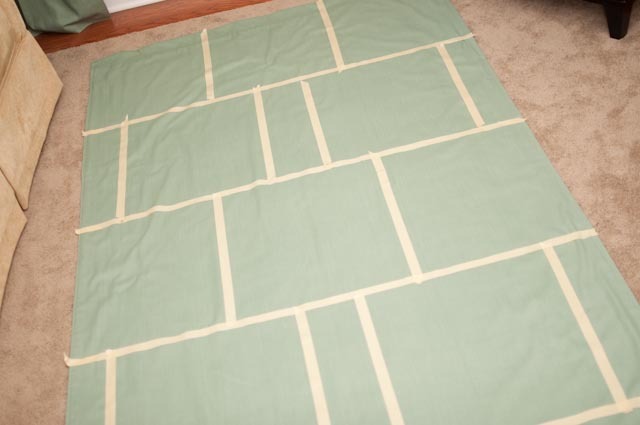 Once I got my paint the right color I measured how large my medallion would be and used tape to space out the pattern on my curtains. Not to discourage anyone from trying this, but stenciling took so much longer than I thought it would. 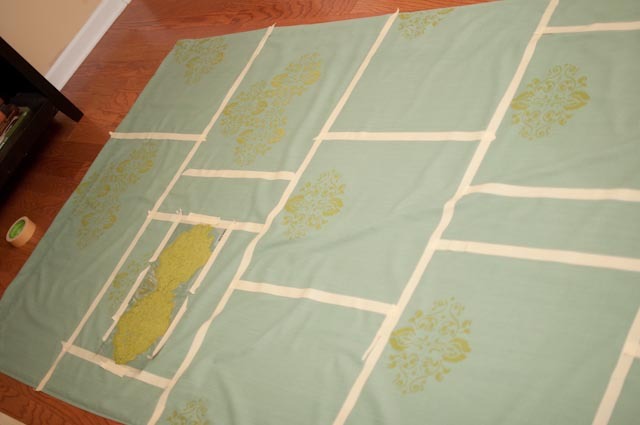 I think I ended up spending about 4 hours figuring out my pattern and then stenciling my first panel. I was so worn out from the first curtain panel that I waited a couple of nights to get started on the second one which didn't take as long. For the second panel I only taped off my pattern horizontally, I wasn't as precise with the paint, and it doesn't look any different from the first panel. $58 is more than I'd budgeted for the curtains, but I was able to cut costs in other places. Even though I spent quite a chunk of time (and money) on my curtains I'm really happy with the way they look. And I'm looking forward to finally sharing my complete living room tomorrow. Can't wait to see the total reveal! these are so pretty! I just found your blog! yay! Wow these curtains turned out so fantastic! I love! Beautiful! I love the stencil you chose. WOW Love these! Might be the next thing I try! Fabulous project, you put a lot of heart into it! I envy your patience with a project like this. The result is gorgeous! Honestly, if I had known how long it was going to take, I'm not sure if I would have done it. If I do this again I'm gonna have to find a faster way. The end product looks fabulous! All the hard work paid off! They look great! I'm considering stenciling some curtains, too. You did a nice job. Holy moly, your curtains are gorgeous! I also love the key art on the wall. You have a gorgeous home, and I love your style! Gorgeous! Love the colors you choose! Looks like a lot of work but it sure paid off! Wow! A lot of work, yes but you would pay SO much more than what you spent for something this striking! Plus you have the satisfaction of knowing YOU did this! Beautiful work! So pretty! Definitely looks like they were worth the time and effort. I'm your newest follower! This is so amazing! 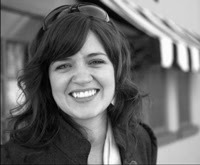 Since I started blogging, I have learned SOOOO much from people like you, and am so grateful! They look awesome! I haven't been able to find the fabric me[dium at Michaels either. Though, I didn't check by the artist supplies, which is where liquitex would be. Did you? I got a shower curtain on clearance for my boys bathroom that I am going to stencil but I can't decide what I want to do on it! Sometimes making a decision is the hardest part! Please stop by my blog when you have a minute! They look wonderful...great job! Found your idea on The Tip Junkie...new follower...I'll be back you have lots of great ideas! I LOVE these curtains! They are gorgeous. 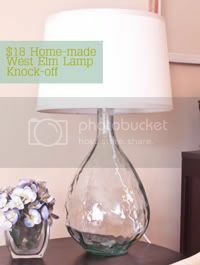 I am moving to a new house and want to make these. What type of fabric did you use? The fabric is really thick indoor/outdoor fabric. I liked using the thicker fabric because the paint didn't bleed through the back. I had the same idea for what I wanted to do with my living room curtains....it's on my to do list lol. Looks great! Stopping by from the Lettered Cottage DIY party. I would love for you to come link up to my party too, going on all week! And be sure to enter my giveaway too! You are quite a crafter and seamstress. You're one smart cookie how you figured out to place the stencil and to make your stencil bigger. That's one of things I love about crafting, it helps us use our brains and use what we didn't think was necessary to learn in school. 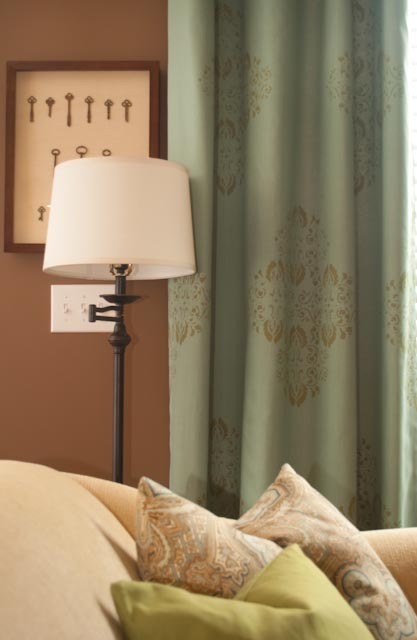 Those curtains are gorgeous, love the color and stencil you used. They really look expensive and custom made. Doesn't it feel great when you make something that turns out so wonderfully? Like wow I made that. Just think what they would have cost from a decorator? 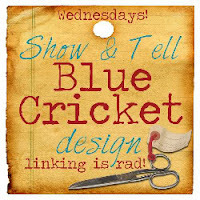 I found your blog thru a link tonight and will be back many times as I subscribed. Can hardly wait to see what you come up with next.